Samsung S5830 Galaxy Ace - Android smartphone phones are now being struck in many gadget lovers. Samsung Galaxy Ace does have its own charm. In addition to display 16M colors TFT capacitive touchscreen that is 3.5 inches wide. Samsung Galaxy Ace is an Android smartphone is pretty responsive to finger touches. Samsung Galaxy Ace already supports 3G and HSDPA 7.2 Mbps. 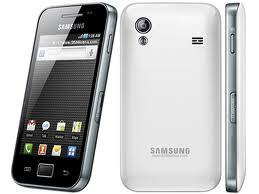 In addition, the internet connection on the Samsung Galaxy Ace can be in sharing with other devices both have wifi device, or can be called with a portable Wi-Fi. Samsung S5830 Galaxy Ace uses a Qualcomm QCT MSM7227-1 Turbo 800 MHz. It also has a 5 megapixel CMOS camera features autofocus, reinforced by a resolution of 2592 x 1944 pixels and comes with a flash light to sharpen the image when the lighting is less.